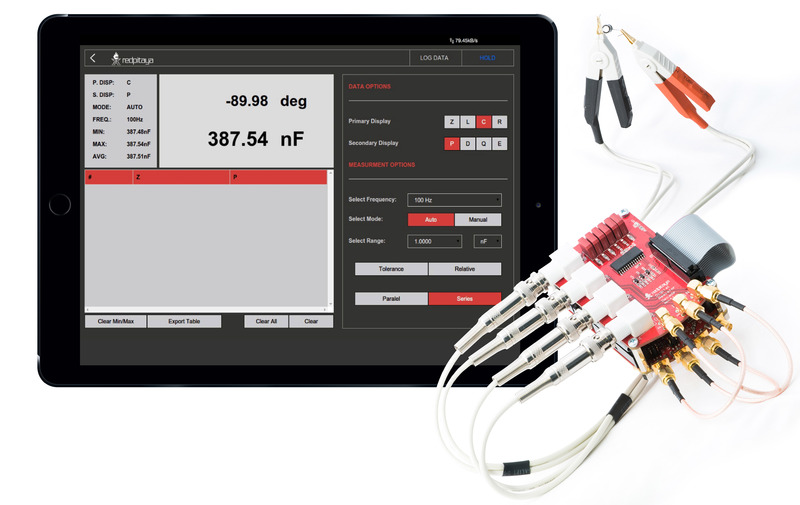 This application will turn your STEMlab into an affordable LCR meter. It is the perfect tool for educators, students, makers, hobbyists and professionals seeking affordable, highly functional test and measurement equipment. The Resistor, Capacitors and Inductors are basic components of all electrical circuits and working on your projects you will definitely need to measure some components laying around on your working bench. The STEMlab LCR meter will enable you to do that quickly and accurately just by switching from one application to another. 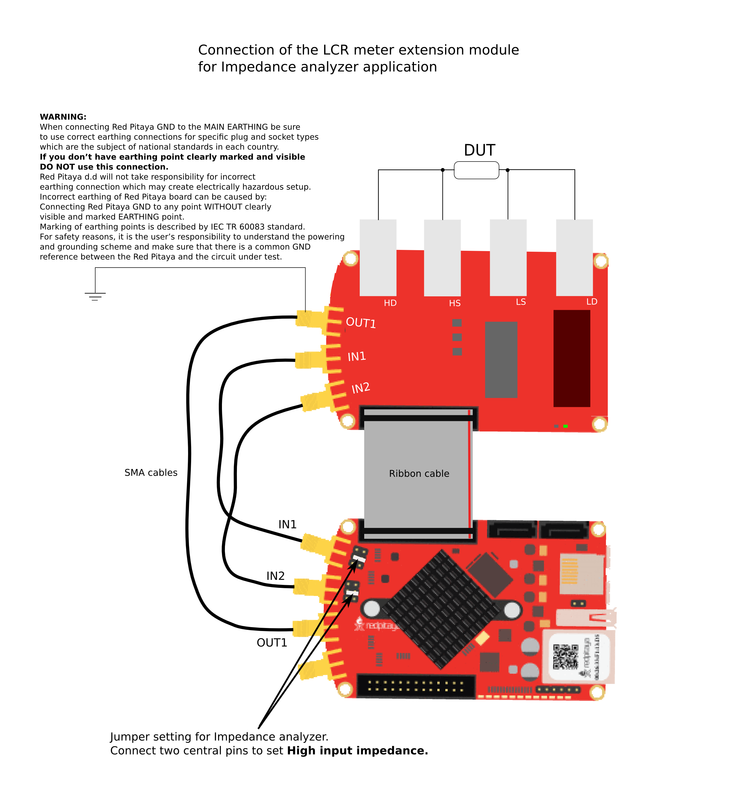 To use the LCR meter application an additional extension module is needed. Module can be purchased from Red Pitaya store. All Red Pitaya applications are web-based and don’t require the installation of any native software. Users can access them via a browser using their smartphone, tablet or a PC running any popular operating system (MAC, Linux, Windows, Android and iOS). The elements on the LCR meter application are arranged logically and offer a familiar user interface similar to bench LCR meters. Hold/Run button: It is used to start and stop measuring. Log data button: When selected, the measurements of parameters selected in the “Data options” field are logged in the table shown in area 6. Data options panel: It is used for selecting the desired parameter for which the measurement will be displayed on the Main window panel shown on area 4. Main display: On this panel the measurements of parameter selected in “Data option” field are shown. Where the Primary parameter is shown with a larger font and the secondary parameter with smaller one. This is a very common practice since by reading values from the display the user can automatically see the most important results. Secondary display: On the secondary display the main settings are shown: current selected parameters, measuring frequency and range mode. Also the Min, Max and Average value or Primary parameters are shown. Logging table: Is used to log and export measured data. Logging is started by selecting the “Log data” button. Option buttons field: I used to manipulate with the table. The “Clear Min/Max” button will reset the Min and Max value on the Secondary display. LCR meter application will enable you to measure basic parameters of the passive electrical components: R – resistance, C – capacitance, L – inductance and Z – impedance. LCR meter enables measurements at 4 different frequencies (100Hz, 1kHz, 10kHz, 100kHz). The user can select desired frequency and the LCR application will use sine signals with the selected frequency to measure the impedance. Since the measured values are unknown, the LCR meter will adjust the measuring range providing the best accuracy. If the user expects some value in creating ranges, then the Manual mode can be used. Measurements modes: Tolerance, Relative, Normal The “Tolerance” and “Relative” buttons are used for measuring in the Tolerance and Relative mode. When deselected, the LCR meter measures in the Normal mode. Tolerance mode: the last value measured before clicking the Tolerance button is saved and used to calculate the percentage difference between the new value and the saved one. Relative mode: the last value measured before clicking the Relative button is saved and used to calculate relative difference between the new value and the saved one. Equivalent Parameters calculation circuit: Parallel, Series The Parallel and Series measuring modes refer to using the Series or Parallel equivalent circuit for the parameters (R, C, L…) calculation from the measured Impedance Z *. LCR meters will only measure Z as the complex value Z=|Z|e^(jP) where P is the measured phase and |Z| is the impedance amplitude. All other parameters are calculated from the Series or the Parallel equivalent circuit.